The customer experience (CX) is essential to the survival and growth of the modern SMB. Without the cushion of multimillion dollar budgets, small and mid-sized businesses cannot make many mistakes during the customer journey. Today's consumer has far too many choices, and they are far too easy to access! Customer relationship management (CRM) software offers companies on a budget the ability to organize customer data on the level of an international enterprise. Prospects are much more likely to convert if sales reps remember names, and customers are more likely to come back if they don't get the runaround during customer service calls. With this in mind, here are 10 of the best ways that SMBs can offer better CX with CRM software. The detailed, real time overview that CRM gives a company about its prospects has a great deal to do with this positive feedback. CRMs store every interaction that a sales rep has with a customer, so your sales reps can focus on the present moment rather than trying to gain context. The automation tools that are built into good CRM packages give companies the ability to expand operations without requiring more manpower. When integrated into scheduling software, CRMs can remove an entire layer of repetitive communications between your sales reps and your customers. This gives your salesmen more time to focus on the pitches that require creativity and problem solving. Storing information about prospects gives a business more than smooth conversation on the sales floor. The information also allow a company to quantify its qualification process. Sales reps spend less time on prospects with less qualifications and more time on prospects who showcase alignment with the trends that have led to sales in the past. Fox Business reports that nearly half of small companies in the United States suffer from data loss. CRM software fixes this problem with periodic, automated updates to backup the current state of your OS and UI. If the platform is in the cloud, the probability of data loss goes down even further. Backing up data consistently reduces the risk of human error creating a huge, irreversible, unexpected problem. With more qualified prospects comes a higher conversion rate. If your sales reps focus attention on the companies that are most likely to convert (as quantified by past data), it only makes sense they will close more, all else being equal. 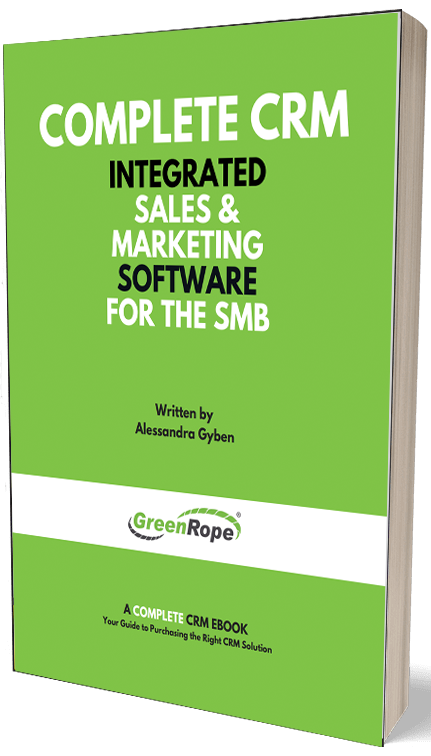 An added bonus - if you do not experience an increased conversion rate after implementing a solid CRM solution, then you know that the problem lies in your sales team. Your customers are communicating with you through multiple channels, at all times of the day and in various formats. Aggregating all of this data is difficult, especially when you probably do not even know that half of it exists. The right CRM platform will not only find these communications for you, it will organize the results in such a way that your can analyze them for trends. Wells Fargo used CRM for exactly this reason - the bank knew that most customers use multiple banks, and one mistake could cause a jump to a competitor. In order to improve its customer service, it aggregated relevant data from social media to find and address problems in a timely manner. It’s also important to note that you should be cleaning your CRM data on a regular basis to stay as organized as possible. The more that your business scales, the more that your clients will demand personal attention. Personalization is quickly becoming par for the course in the digital marketing space - even B2B clients who are using the same automation techniques as you are want to see some effort put into the communications. CRMs that integrate with call center software allow your company to streamline research efforts by your sales reps. Just one look at the easily accessed UI gives your rep the inside scoop on a company. You can call decision makers by name, remember their placement in the sales funnel, and build rapport around little details in past conversations. Video game publishing giant Activision is a great example of a company that extends its sales funnel beyond the product purchase. This is a company that does not allow buyer's remorse or leftover customer service queries. By monitoring social media and following up on loyal customers through CRM, the company was also able to reduce its CX expenses by one quarter. It is difficult to update a customer account if you do not have any original information to begin with. CRM gives your company a baseline context from which to update a relationship. This can be done in real time, as catering company Munchery showed. Munchery used CRM alongside a proprietary app to allow customers to implement last minute changes to orders, up until the moment that the driver was ready to walk out the door to deliver the food. The result was a closer relationship with the client base, less customer complaints, and better CX for customers overall. One added benefit - Munchery reports that the customers with the most frustrating last minute changes often become the biggest evangelists for Munchery when the company comes through. CRM makes it easy to see who is loyal to your company. Not only can your sales reps personalize conversations, but they can also personalize loyalty offers. Imagine the retention that you might achieve with an automated upsell that corresponds to the exact time frame, budget and utility of a past customer. The right CRM allows you to utilize downtime with a customer as well. Even if a client does not need anything immediately, you can keep your company top of mind by offering a timely, relevant loyalty program that is geared specifically to the needs of that client as specified in past notes. The way that each company will interact with its customer base is different. However, the 10 points above provide more than enough reason to invest in a competent CRM software platform, even if you do not think that you can achieve all 10 points at once. American Express recently reported that positive CX has caused 75% of consumers in the US to increase spending. There is a huge amount of opportunity in the SMB space as well - 80% of these same respondents reported that SMBs had better CX than enterprise level companies. Keep in mind that the best CRM platforms grow with your company. You will be able to better utilize the advantages of the technology with practice and scale.